Every time when you see websites having a countdown timer, It will automatically increase your excitement towards it. Isn’t it? So, If you have a website and want to add countdown timer for a new product launch, limited time offers and discounts etc. Then you must use Countdown WordPress Plugins. These plugins will help you to insert customizable attractive looking countdown clocks with a bunch of rich features in it. Here in this article, I’ve accumulated some of the best WordPress Countdown timer plugins which will surely gonna brings excitement amongst visitors with their amazing functionalities. 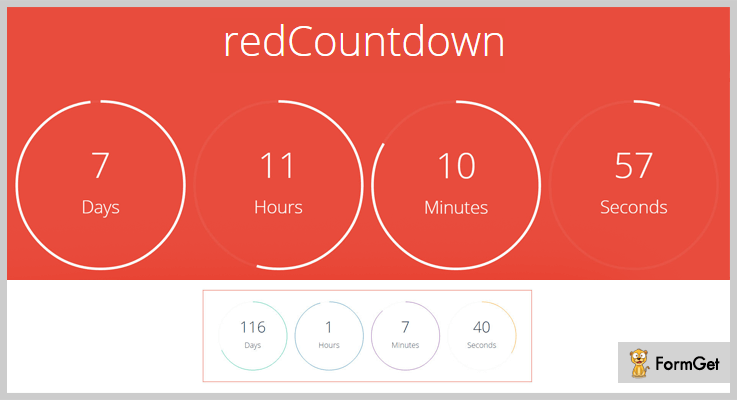 Red Countdown WordPress plugin is fully responsive which lets users create attractive circular countdown timers. The circular countdowns are based on HTML5 canvas and look amazingly spotless. Along with line, the plugin includes 12 presets which can be modified easily. You can buy this WordPress plugin from the Envato market at just $13. This plugin supports almost each and every web browser such as Chrome, Firefox, Internet Explorer etc. It also provides powerful shortcode which you can embed it on your website and place the timer in a position that you want. This plugin gives you an entire interface for customizing the plugin. 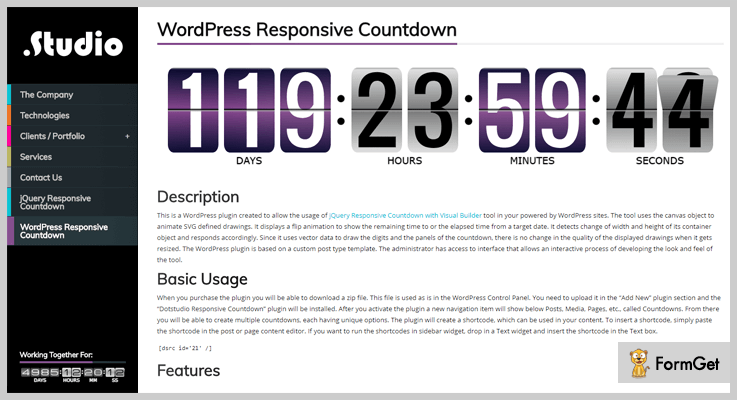 You can also add your own CSS to change the appearance of the countdown WordPress plugin. This Countdown timer plugin for WordPress makes adding the countdown timer easier and simpler on your website and makes it more beautiful. You can this timer tool as the countdown for events, product launch, the expiry date for discounts, offers, and coupons. Countdown Timers is a simple but ultimate plugin for WordPress which offers clean and mobile friendly interface. For 5 sites – $20. The plugin comes up with 10+ clock styles along with expiry time functionality. In the kit, you’ll have CSS editor and timer clock options to give you 100% control over it. It is fully responsive, customizable and mobile friendly plugin so that you can use it effectively. This plugin supports multiple languages also. With this Countdown Timer Pro, the countdown timer functionality can be added anywhere on your website whether in content or sidebar area. It gives you a full control of your counter. You can create specific style or script to the selector of the counter. Along with that, this plugin comes with shortcode generator and a multi-attributes sidebar widget, packed with a bunch of options. This plugin offers different templates styles, through which you can customize background color and counter font size etc. It gives you the option of an intro and outer text which helps you to add additional text or HTML. You can also build recurring event or cycling post via its free addon. 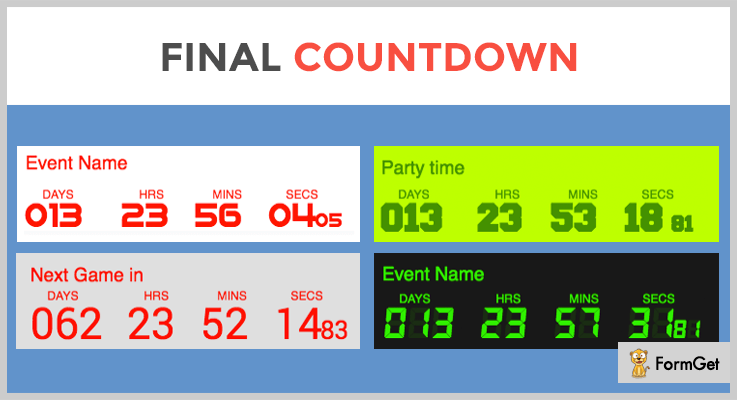 Countdown Pro is a live counter which synchronizes with server time. You can also add a URL upon expiry. This WordPress plugin provides you the jQuery Responsive Countdown with Visual Builder powered by WordPress sites. The WordPress Responsive Countdown plugin animates SVG drawings by using canvas objects. Moreover, it displays flip animation for displaying the remaining time or collapsed time.It displays a flip animation to show the remaining time to or the elapsed time from a target date. This plugin kit cost you $10 for 6 months support. If you want to extend its support period upto 12 months, you’ll have to pay extra $2.25. Through its interactive admin panel you can change the look and feel of your countdown timer. It uses vector data to the panels and digits of the countdown timer. You can set your timezone and label fonts, size and captions. It provides the feature of count-up and count-down. This plugin gives infinite color options for digits and panels. 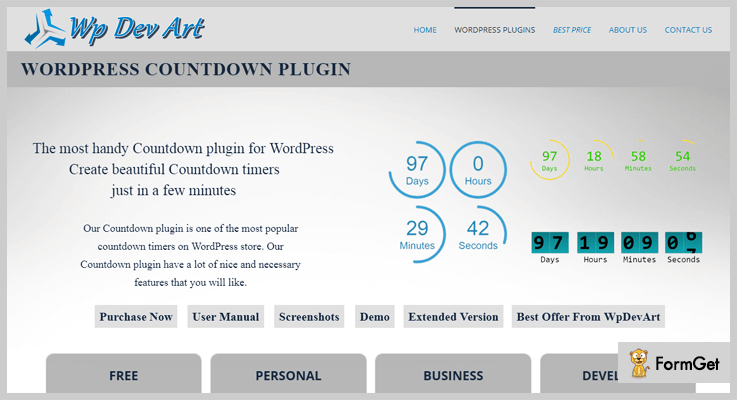 WordPress Countdown plugin by Wp Dev Art is one of the most popular Countdown timer plugins on WordPress. This plugin offers lots of features to please you such as animation effects, sidebar countdown timer, fully customizable and responsive designs. You can easily install this functional countdown WordPress plugin in just a few minutes and create different types of countdown along with stylish effects. Personal: $13 includes single site license. Business: $27 for 5 sites. Developer: $45 for unlimited websites. This WordPress plugin also offers a free plan but it does include advanced features. The plugin offers 39 animation effects which make your countdown timers more attractive and user engaging. It provides the ability to add default text in a day, hour, minute, and seconds field. 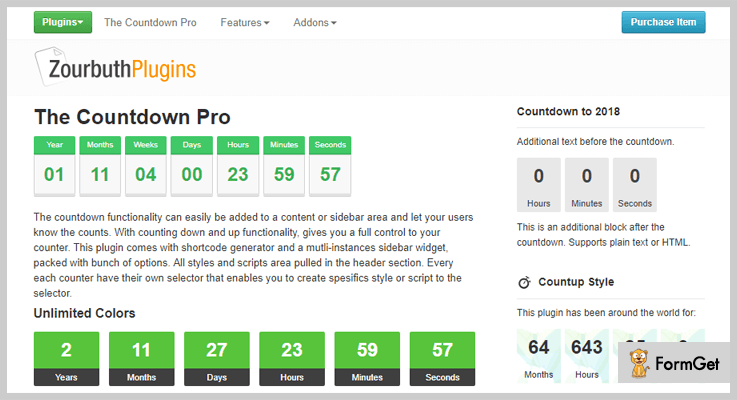 This plugin gives you the facility to customize your countdown timer such as its border, width, and fonts etc. It gives you full customer support and tested on popular WordPress themes. This plugin gives you the full facility to add countdown timer in your posts, pages as well as on widget area. 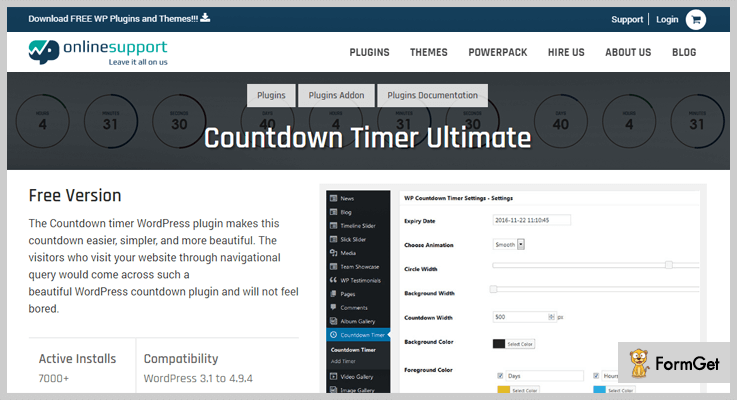 Coming Soon is an ultimate plugin for WordPress which comes with 2 modern layouts and this Countdowns plugin is the most popular in its niche. This plugin allows you to continue your backend work on your website and lets your visitors see the Coming Soon page along with countdown. And when you are done with your work, you can bring it live back with a click! You can manually set the “coming soon” page on the page which is under maintenance and rest of the pages of your website are available for users. Grab this plugin at just $17. 6 full-screen backgrounds. (full color, parallax image, simple image, slideshow, special slideshow, video). You can also customize its transparency from 0 to 100%. A feature of pop -up for displaying more information. Flexible Menu pages, you can on/off menu pages according to your need. Supports 9 email marketing platforms too. (MailChimp, Constant Contact, and icontact etc). The countdown WordPress plugin has the functionalities that can easily be added to your site at drop of a hat! It also provides count-up and count-down feature which gives you a full control over your counter. This plugin comes with the bunch of options and multi-instances sidebar widget. It is free of cost CountDown WordPress Plugin, grab it from the WordPress repository. Customizable background colors and fonts. Facility to add additional text or HTML. This plugin gives you a facility to add URL upon expiry or for replacing the current page. Adding a good looking and attractive countdown timer on your WordPress website with this plugin is as easy as pie. It shows days, hours, minutes, seconds and even milliseconds too. This plugin can be easily shared and synchronized across multiple websites. Furthermore, you can also embed its widget on your website. Get this countdown plugin for free from the official WordPress website. It supports all the mobile platforms such as Android, iOS, and Windows etc. You can see your live countdown timer from any device. Facility to count-up at any point of time. It gives you a widget form to enter your event name and countdown settings. Finally, the above-listed Countdown WordPress plugins come with productive features which engage your website visitors. You can’t judge a book by its cover. So, click on all the countdown WordPress plugins and find the best fit for your website. Please share your primary countdown WordPress plugins in the comment section.